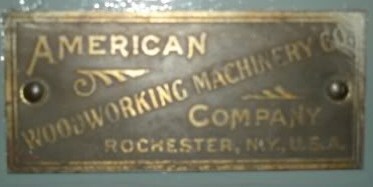 American Wood Working Machinery had a great number of machine designs, most of which stemmed from one of the 11 parent companies. The following is a description of where these models were originated and where they ended up being produced some time after the merger. First: How do you read the tags on American machines? 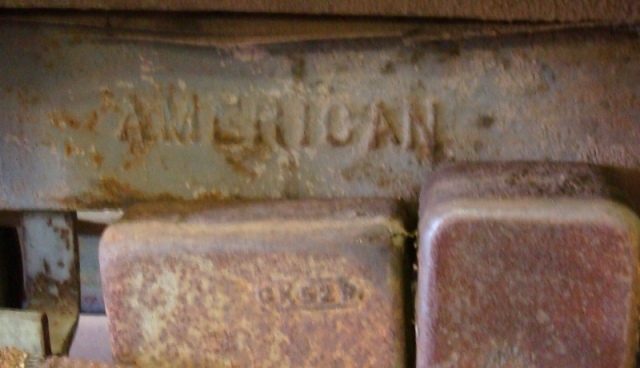 American machines have five kinds of markings on them. First is the raised cast letters saying “American”. Machines can also be double badged such as this No. 1 planer. 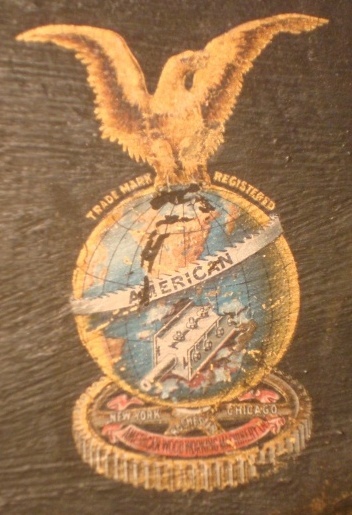 And as in this No 4 Band Re saw, with this on the base and “American” on the column. 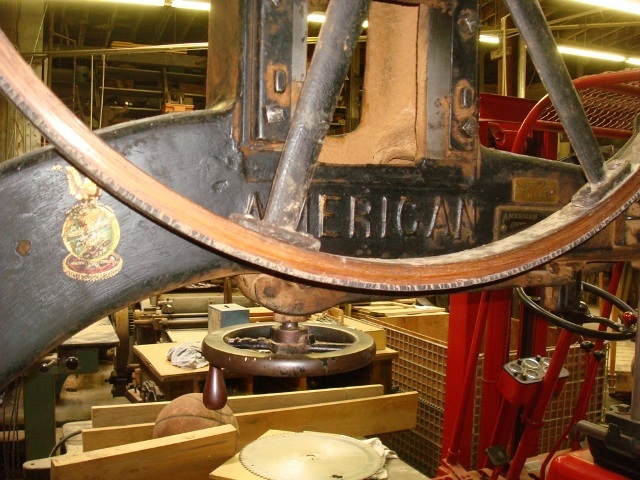 Another variation is a bolted on “American” and the original designers name cast in a main part of the machine. The dual tagging is much more prevalent on the earlier machines slowly having been phased out as American Established themselves as a name. This badge is can be in several forms and is the indicator of where the machine was actually made and not whose design (of the original 11 companies) it was. The Clement plant had an odd angle badge called the redundant badge because it says “Co. Company”. If your machine has this it is important to include that into the photo submission. 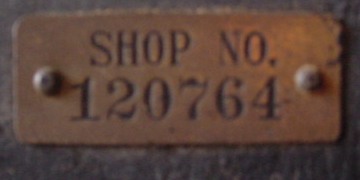 Third is the “SHOP NO.” tag. This is in effect the serial no. for the machine. AWWM did not do any other form of serial #’s that we know of. Fifth are the casting Part nos. They are nothing more than part numbers and appear on later machines. Occasionally you can find all these markings on a single machine. Usually band saws are like that. Now to the deciphering of “SHOP NO.” and origin of machine designs and later production locations. 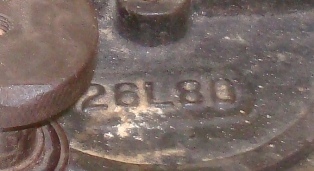 With 5 and 6 digit “SHOP NO.” the first digit indicates the place of manufacture. It does seem to hold up for both 5 and 6 digit “SHOP NO.”. Four Digit “SHOP NO.” indicate very early machines. To date we know of no less than a 4 digit “SHOP NO.”. No. 111, 110, 109, and early large dedicated band re-saws. 3 = Williamsport Machine Company /Branch 10 Williamsport plant. This may be a hard one to figure out since Hoyt made big machines that were put through heavy production, worn out, and scrapped. 5 = Levi Houston / Montgomery Plant. Unknown or moved to R&H. This is by no means Complete. All are encouraged to update their submissions to the Photo Index, update “SHOP NO.” when possible, so that the AWWM guru’s can indulge in more speculation. From what I have gathered on the Angled badges the Williamsport plant went from "Woodworking" to "Wood Working" around the time they went from a 5 to 6 digit shop no. The largest gap between two machines in shop no.s is from the Houston plant with 14190, the closest are early Clements 15 apart. Plausible production numbers for each plant. Assuming that all machines started with a 5 digit number and X0001 is machine number one from a give plant and the last serial number known is the last plant. THESE ARE BIG ASSUMPTIONS, so take these numbers with a grain of salt. Most of the following information comes from a 1898 AWWM Co. price list that was once owned by Edmund K. Shollenberger. Edmund was a sales rep for AWWM Co. in Montgomery, PA and he recorded a few notes in his price list that help pin down some history. Ed's dad D. W. Shollenberger was head accountant for Levi Houston before the AWWM Co. merger. I have no other info on his position in the company after the merger. Note that the Globe Machine Co. was not part of the original merger but they do show up in the list of the machines printed in the December 1898 price list so they were acquired by that time by the new AWWM Co. Following the merger of these 11+1 companies there was an incredible amount of redundancy in the offerings from AWWM Co. an example would be band saws. They were offered from at least 7 of the plants in many of the same sizes. It took some time but as plants were dismantled or sold production of some models was either ceased or moved to one plant. 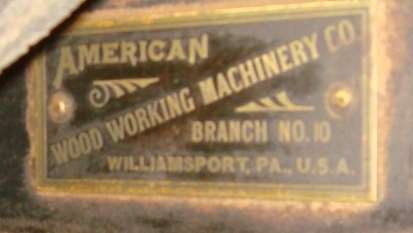 Scroll type band saws were moved to Branch #10, the Williamsport factory. 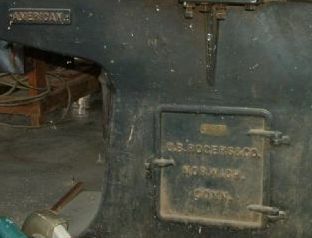 Larger resaws were manufactured at branch #1, the Clement Works at Rochester. Grinding machines ended up being made at branch 9, the Rowley and Hermance works. Jointers were made at both the Clement (branch 1), and Williamsport (branch 10) works. Lathes were split with the larger pattern makers and automatic lathes being made at the Clement works and the speed lathes being made at the Levi Houston works (branch 5). From Edmund's notes it appears that most of the Globe works production was moved to Green Bay, WI at the old Milwaukee Sander plant. The exception was the "Money Maker" planer production was moved to Hoyt works in IL. Most of the Glen Cove production was moved to the Rogers works in Norwich. The only machine listed in 1898 for the Young Brothers was a vertical/horizontal borer. This must have been discontinued as there is no note of its production being moved. Lehman Machine Co. is still listed in 1898 as producing the "Union" 24" double and single surfacer, hand planers (jointer), and double spindle shapers. Someday an example may surface. Another note is that in 1898 the #3 Williamsport planer sold for $220. Probably not too far off what it would fetch today. A #1 variety saw bench with boring attachment sold for $140.